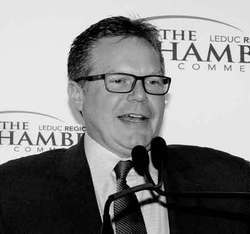 Edmonton-Leduc MP James Rajotte was the guest speaker at the Leduc Regional Chamber of Commerce's February Luncheon. Photo by Lorna Lowe. February's Chamber luncheon brought a sold out crowd to the Leduc Recreation Centre to enjoy a fabulous buffet of homemade food (including the bread!) and to hear our area's Member of Parliament, the Honourable James Rajotte, give an overview of the recently released Federal Budget. The luncheon got off on the right foot with the staff at the Nisku Recreation Centre outdoing themselves by creating a scrumptious lunch buffet offering a large selection of food that would tempt anyone's taste buds, and then Leduc's Chamber Executive Director Shaun Green announcing that the organization has once again had an "impressive" couple of months by welcoming fifteen businesses as new Chamber members over the Christmas season and throughout January. Acknowledging the speaker for the day, MP James Rajotte, by congratulating him on his reappointment as the Chair of Parliament's Standing Committee on Finance the previous week, Shaun welcomed James onto the podium. James said that he realized his time to speak was relatively short but that he would do his best to touch on as much of the recently released Federal Budget as possible. He began his presentation by stating that overall, fiscally Canada has done "fairly well" in comparison to the other G7 countries. He shared that within the G7 group Canada has had the highest GDP growth within the last year as well as achieving the highest full time income job growth. Canada also holds the lowest debt to GDP ratio and this last year we have now been rated as the second best place in the world to do business. James commented that the only area that is lagging are our exports but he is hoping to see that pick up soon with the recent strengthening of the US dollar. With a steady 3.5 % growth predicted for Alberta this year James said that the Province is looking forward to "getting back to a balanced budget." Quoting projected numbers that had been presented in the Federal Budget earlier in the week, he said that Alberta is "on track" to realizing the predicted $6 billion dollar surplus in 2015. Commenting on the surplus, (when it happens) he said the government needs to treat it like a household budget and that even though the money is there "We can't just spend it." Informing the audience that "We have funded the high priority areas but tightened our belt in Ottawa." James then began to speak about some of the areas where the government is focusing our tax dollars. job incubators and training programs for workers. James also spoke about the aboriginal workforce by saying that it was fine to provide training opportunities at the secondary school level but he stated that, "It has to start at the K-12 level. The reality is that we need to ensure that people in aboriginal communities have the same opportunities as everyone else." Briefly touching on Temporary Foreign Workers, which he acknowledged is a pretty hot topic particularly in this region, he said that employers should see "…some changes coming down the pipe fairly soon." that would ease some of the red tape and paperwork involved in bringing qualified workers into the country. Another topic that had ears perking around the room was when James spoke of the several pipeline projects that are pending across the country. He stated that the most "realistic view" is that the east/west line is the "most likeliest" to go through, and then drew a laugh from the crowd by commenting that the Keystone XL pipeline project is probably the most studied thing in human history. However he then shared that while he was still crossing his fingers that President Obama will make a decision to move forward with it he was "..frankly not as hopeful on this one." James then spoke about a new initiative built into this budget that he commented "…in my opinion should have been done a long time ago," with the commitment from the government for $8 million dollars to create a DNA Databank for missing persons and recovered remains. He shared that this databank was being created in large part due to "Lindsey's Law" which stems from the dedication of one BC mother (Judy Peterson) who has been campaigning for a databank like this since the disappearance of her daughter, Lindsey Nicholl, in 1993. In his closing remarks James extended an apology to Canadian Veterans where he said that over the years, communication has been lacking between the government and their organizations. He shared that several million dollars have been committed in this budget to renovating and correcting some areas involving veterans benefits and he encouraged any veterans within his area who are not receiving their proper benefits to contact him directly. ­­He then opened the floor to a few questions from the audience before retaking his seat to an appreciative round of applause. Shaun came back to the podium to close the afternoon with the announcement that the Annual Chamber Gala was now a sold out affair and to remind everyone to get their tickets early to March's Chamber luncheon taking place on March 7th at the Leduc Denham Inn & Suites with guest speaker Todd Hirsch, ATB Financial's Chief Economist.